Being an educator is no easy feat, and the Indian River School District this week celebrated the teachers who bring passion and skill to the classroom every day. Courtney White of North Georgetown Elementary School was honored as the IRSD Teacher of the Year for 2018-2019. 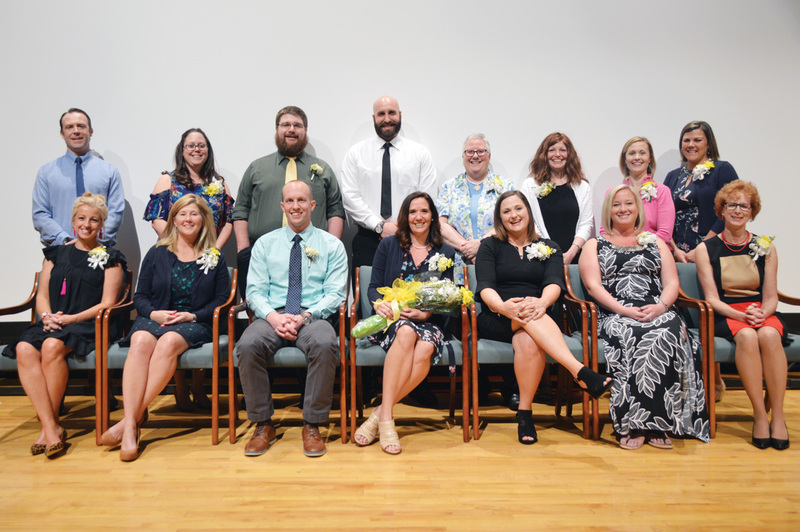 The announcement was made at the district’s annual Teacher of the Year celebration on April 26, honoring each of the 16 teacher candidates — one from each district school. “You represent the many outstanding educators in our district who work hard every day to provide our students with inspiring instruction that allows them to thrive and be the best they can be, each and every day,” said IRSD Board of Education Member Jim Hudson. “From the first day they walk in to kindergarten to the last day they walk out as a graduating senior, the most influential people in the life of a student is a teacher,” said Superintendent Mark Steele. One educator from each school was selected a Teacher of the Year for 2018-2019: Mallory Anderson, Selbyville Middle School; Sue Keefer, G.W. Carver Academy; Dara Callaway, East Millsboro Elementary School (finalist); Kathryn Gichner Curl, Georgetown Kindergarten Center; Christine Purcell, Georgetown Elementary School; Brian Murphy, Georgetown Middle School; Corinne Elliott, Howard T. Ennis School; Nate Mohler, Indian River High School; Michelle Truitt, John M. Clayton Elementary School; Lori Hansen, Long Neck Elementary School; Jennah Truitt, Lord Baltimore Elementary School; Robert Syphard, Millsboro Middle School (finalist); Courtney White, North Georgetown Elementary School (district winner); Nichele Lobo, Southern Delaware School of the Arts; Joseph Macaluso, Sussex Central High School; and Kelly Namorato, Phillip C. Showell Elementary School. Each school selects a building winner who embodies their school and colleagues. The winners then submit to a multi-tiered IRSD selection process. The IRSD winner continues to the state and possibly the national level. In the audience at the April 26 event, White was surrounded by family and coworkers who erupted into cheers. White appeared happy and emotional as she took the stage. “I know you will fill my shoes, and then some,” said Lisa Richardson, IRSD Teacher of the Year for 2017-2018. As an educator, White said she closely considers who each student is and where they’re starting. “My job is to help each of them get empowered and reach their goals. We can do that by teaching them that effort can help them achieve anything and that they can be resilient in challenges that they face,” she said. “Especially with some of the hardships we face with funding and poverty levels, and when I think of the challenges of North Georgetown and to see your Teacher of the Year come from that, I’m very proud,” said state Rep. Ruth Briggs King (R-37th). Arriving at North Georgetown in 2016, White has been a teacher leader for years. She was the Seaford School District’s Teacher of the Year in 2010-2011, having worked there from 2003 to 2016. She was also a Delaware Dream Team teacher in 2016, a TeachFest Delaware Spring Academy teacher in 2015; and the co-creator of the Personalized Virtual Summer & Intersession Academic Program at Central Elementary School in Seaford from 2014 to 2016. She has also taught in the Wilmington University graduate program and the Delaware Tech certificate program. White holds a bachelor’s degree in political science from Goucher College, a Maryland State Elementary Education Certificate from the College of Notre Dame in Baltimore and a master’s degree in applied technology from Wilmington University. White has been repeatedly praised by her colleagues and administrators for her use of technology in the classroom, her own willingness to learn and her inspiration to help other teachers improve. “It is evident that students are expected to make mistakes in order to learn and grow. Mrs. White spends time building a culture of respect, not only between her and the students, but among the class,” according to one colleague’s nomination. “She has taken the time to create a safe learning environment, where cooperative learning takes place and students know they can take risks…,” another colleague wrote.